His sister said it. Kind of. A couple of months ago, Isabelle picked up the phrase “Dang it!” at school. I tried to curb her use of the phrase when she began using it. I started with, “That’s not how we express our frustration.” When I heard it again I said, “That’s not how we speak in this house.” By the third time I heard it, I invoked something I knew would make her stop, “If you keep saying it, Ari will repeat it and that’s not how we want him to talk, do we?” She agreed that wouldn’t be a nice thing for a little boy to say. Therefore, Isabelle cut back on her use of the phrase “Dang it!” to show frustration or disgust. But every now and then, that little phrase seeped out of her mouth. I knew he didn’t get “Dammit” from Isabelle (She doesn’t know the word damn!) any more than he got it from us. It was just his way of repeating “Dang it!” Except, it sounded way worse in his two-year-old voice. Despite Isabelle curbing her use of that two-word phrase, Ari continues to repeat “Dammit” at the most inopportune times. One of those times was while we worshipped in synagogue this weekend. Thankfully, everyone else was singing and no one — except for me and maybe the kids behind us — heard Ari. As for me, I’m trying to ignore the phrase that sounds way too close to damn it coming out of my two-year-old’s mouth because I know to ignore — rather than having a big reaction — is the way to eradicate something you don’t want to hear your child say. It’s been four LONG days of ignoring the “Dammit” utterances. This makes me wonder just how much longer it will take for me to ignore this problem away. 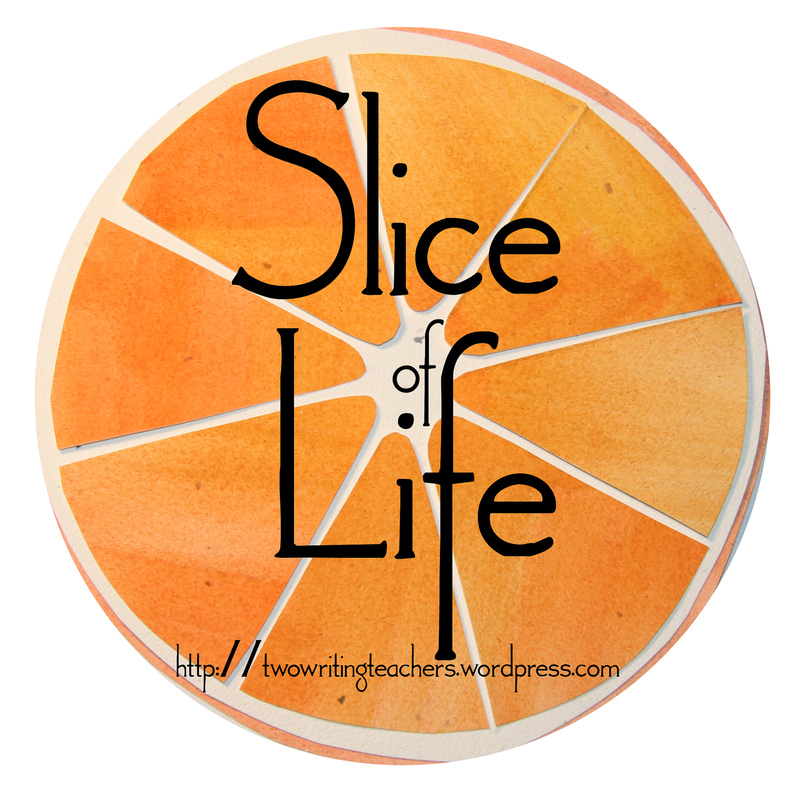 Head over to http://twowritingteachers.org on Tuesdays for more slice of life stories. Here she is! She got the plastic cup she requested WITHOUT having to repeat herself or with me chiming-in to clarify what she said. If you’ve never had or worked with a child who has fought for every word s/he says, then you probably won’t understand why something as small as what I witnessed this afternoon feels so monumental. But my kid has fought for every single word. And that’s why things that might be commonplace for a child with typically-developing speech feel so huge. 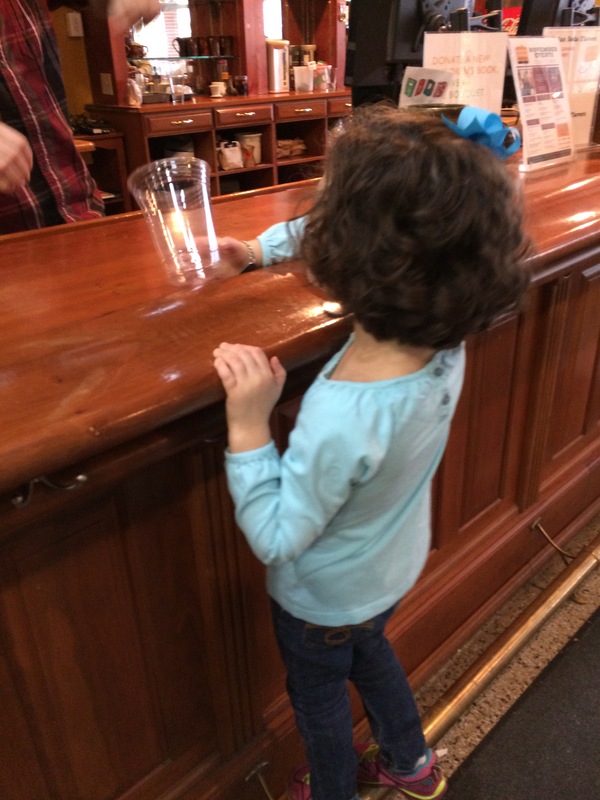 We were snacking with friends at the Midtown Scholar Bookstore when Isabelle declared she wanted another apple juice. “You can have some water,” I replied. I froze a couple steps behind her. My mouth hung open. Did I just see what I thought I saw? Who was this confident kid? Once I finally found my words, I thanked the man and praised Isabelle. I don’t remember my exact words to her because I was gushing. I told her I was proud of her for using her voice to ask for something. I told her I was delighted she took the risk to speak to someone who she thought could help her get what she wanted. I told her I was thrilled she used good manners without me having to remind her. This doesn’t happen every day. In fact, it rarely happens. Getting Isabelle to order in restaurants is hard. She rarely does it unless she feels very comfortable. I think it’s because she knows she’ll most likely be misunderstood and that bothers her. I never would’ve expected her to do something like this in a place where she’d only been once before. But she did. And for that reason, I’m a very proud mama tonight. 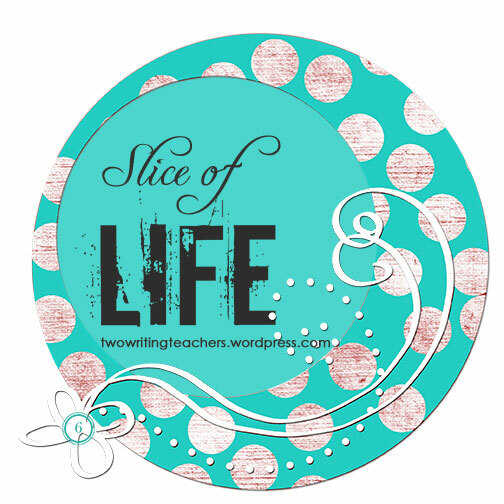 Head over to http://twowritingteachers.wordpress.com for more slices of life. I’m learning how to tell my toddler something once. And only once. Dressed (with wet hair to boot) and reading. The first test of my new resolve came after a morning shower. I put Isabelle’s diaper on and covered her with Cerave. Once her hair was done it was time to get dressed. I picked out clothes from her room and brought them back to my bedroom. “Let’s get dressed,” I said. “Mommy’s going to put your undershirt on you now.” And I did. “I’m going to put your shirt on next.” And I did. “You may stand up so I can put your jeans on,” I commanded. She did. And then she ran across the room sans pants. “You may come back here to get your jeans on,” I said. And then I stopped and stared at her. She stared back at me from across the room. Don’t say another word, Stacey. Just keep looking at her. And I did. For two minutes. Those two minutes seemed like two hours as we faced-off. Every now and then during those two minutes I’d tap the carpet with one finger. Isabelle would look down and do nothing. Suddenly, she broke my gaze and walked over to me. I put those jeans on her like it was nobody’s business. 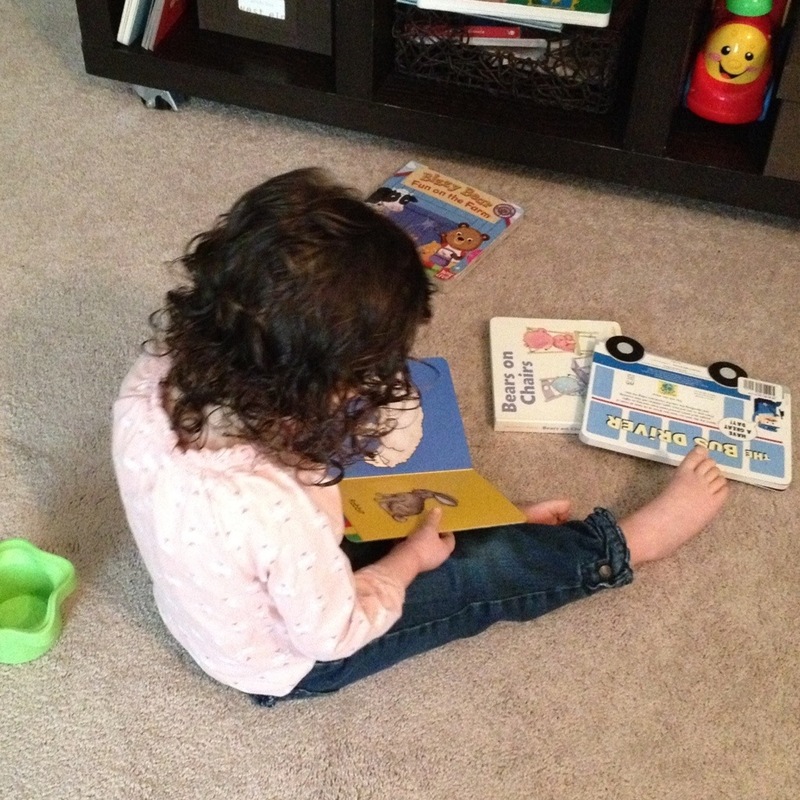 And then she went back to reading her books. I have no idea what’s next, but I know I’m going to give her a command once. Just once. And wait. Even though it’s still February, I think this is going to be my first slice of life story for the upcoming challenge over at Two Writing Teachers, my other blog I co-author with Ruth Ayres.